Is It Possible to See the World by Train? Trains are all over the world…they’re everywhere and come in all shapes and sizes. Some are for long distances, some are for short trips of a few hours, and some are “hop on and off” to see interesting places. Train travel can give you a unique view of your world, they’re a whole new experience. Let’s take a ride on the rails, and see what we can see! ALASKA. The tracks are the same, but the cars are upgraded. All the way from Whittier or Seward on the coast to Fairbanks, it is amazing adventure. Spectacular scenery, warm and wonderful people, wild and wonderful game viewing, and lots of stops along the way. Several of the cruise lines have cars attached to this long train along with the Alaska Railroad cars. 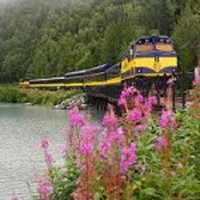 Package this trip with stops at some wonderful sights such as the capital of Anchorage, the city of Wasilla, the village of Talkeetna and most of all Denali National Park. CANADA: Via Rail is the Coast to Coast train across Canada. From the beautiful city of Vancouver to the east coast town of Halifax. Get a coachette and stay on the train for the full time or put together a package that stops along the way at Jasper and the Columbia ice fields, Niagara Falls and Toronto, Montreal and Quebec City. THE LOWER 48 STATES: Amtrak has upgraded many of her trains and routes to give you a wonderful relaxing way to see the USA. They have included package stops in many cities allowing you to sight see along the way. Hop off and stay a few days at cities that are interesting to you. In addition to Amtrak, round trip Boston on New England’s Fall Foliage Express takes you to the color of the Northeast. You stop in charming towns such as Kennebunkport, North Conway, Franconia Notch, Stowe, Mystic Seaport, Newport, and Cape Cod. Spend a few days before or after in Boston. Other train adventures are through the Canyonlands from Salt Lake to Albuquerque; Trains across Scenic Colorado round trip Denver; Scenic Trains of California; Rail to Glacier Park round trip Seattle; and Texas Gold Express out of San Antonio to name a few. Many cities have local trains that are narrow gauge or otherwise that are great day trips. Don’t forget to collect your narrow gauge collector pins. Some serve dinners and have mystery shows as you go along. SOUTH AMERICA: Putting together a tour to Machu Picchu will include the train that goes from the gorge of the Urubamba River to Agua Caliente. The scenery is spectacular and the people warm and friendly. You share the train with some of the locals as they go about their lives. 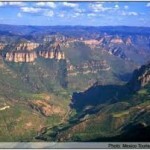 MEXICO: One of the most interesting trains is through the area in Northern Mexico known as the Copper Canyon. You go from El Fuerte on board the Chihuahua-AL-Pacifico route into the wilds of the Sierra Madre Mountains. This canyon is 4 times the size of the Grand Canyon. It took 100 years to build this railroad that goes from sea level to almost 8,000 feet crossing some of the highest bridges in the world and 87 tunels. You stop for the night in a beautiful hotel that hangs onto the cliff of the mountain. There you will meet the Terahumara Indians who live in caves in the canyon. The women wear beautiful colorful skirts and sit outside the hotel weaving very unusual baskets. Be sure to take a big garbage bag to bring some home. The men work in mines in the bottom of the canyon where temperatures reach over 120 degrees. This is an amazing – not to be missed trip. Express, and the Blue Train. The Rovos is the most luxurious train in the world going from Cape Town to Dar Es Salaam. It carries 72 passengers in 36 superbly appointed suites. Ascend the forested Magoebaskloof with it deep gorges and ancient cliffs. Every night you will be staying in an enchanting camp with local game viewing. Add onto this experience visits to Victoria Falls or include a golf safari at select golf courses in South Africa. The choices are endless. The Blue Train runs from Pretoria to Cape Town and from Tshwane to Victoria Falls. The Shongololo Express offers a rail experience through South Africa. Both of these are luxury accommodations and can be included with many other African experiences. EUROPE: Trains in Europe are well known. Many different packages are available to cover one country or many. The timeliness and the comfort are legendary. 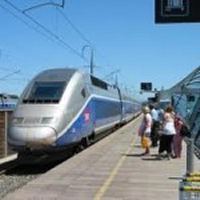 Combine the train with a car and this will take you to all kinds of wonderful charming villages. Just pick the plan and you are on your way to adventure. The Venice Simplon from London to Venice or reverse. The charming English countryside through the Austrian Alps. Another route is Paris to Istanbul with stops in Budapest and Bucharest. These are the birthplaces of Empires. The Northern Belle fulfills the highest expectations of the original trains of the 1930s. Seeing Great Britain by an exclusive train in comfort and luxury. The Royal Scotsman offers a short break tour of the spectacular Scotland scenery. Go right to the heart of the Highlands. The ever-changing countryside and wild coastal scenery. The Eastern & Oriental Express is a classic journey linking Singapore and Bangkok. Enjoy the open end Observation car ad you journey thru amazing scenery, magnificent temples and palaces. Contact me to send you on one of these amazing train journeys, and see the world!